In a modern society supposedly desensitised to blood and horror, the grim tale of Medea might just be one of the last taboos. Apart from perhaps Oedipus, whose plight has been largely subsumed into Freudian psychoanalysis, it is this vengeful murderess and her infamous crime of infanticide who holds the greatest sway on the modern imagination of all the protagonists of Greek tragedy. Passed down through adaptation upon adaptation, this latest version by Mike Bartlett and Headlong sees her transplanted to the unlikely location of a British housing estate. The chorus become gossiping neighbours and work colleagues, all nosily observing the collapse of Medea’s family as philandering husband Jason prepares to marry Kate, the young daughter of his landlord, while Medea and her son Tom co-exist in a silent state of grief. Bartlett’s conflicted updating of Euripides’ tragedy is myth as simulacra – all surface and no depth. His approach opts for naturalism with a hard, plastic edge, drawing attention to its own fakery, while everywhere the artificial and the shallow loudly dominate. Medea’s “friends” keep up the appearance of concern while pursuing their own interests and desires; the dissatisfied next door neighbours make relentless home improvements; Jason and Medea’s silent, ghost-like son might as well be the symbol of a child. Nowhere is this sense of the superficial facade more unsettlingly conveyed than in Ruari Murchison’s pop-art doll’s house of a set, which conceals four boxed-in rooms behind screens displaying the pointedly flat exterior of Jason and Medea’s house. These contained domestic spaces are disturbingly neat, pretty and precarious, a fitting microcosm of the identical houses and manicured lawns that fill the sterile, hermetically sealed suburbia outside. 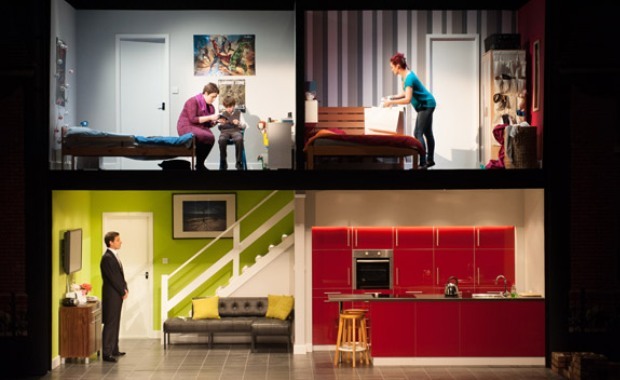 Like the chilling rows of perfectly pastel homes in Edward Scissorhands – far more frightening than Johnny Depp’s razor digits or shock of black hair – the production evokes a stifling suburban ennui in which Rachael Stirling’s restless, raging Medea writhes like a flame-haired Fury. What Bartlett is attempting to demonstrate through this shiny, brittle aesthetic, however, never becomes fully clear. Is the unapologetic flatness of both design and performances a comment on the superficial emptiness of modern life? If so, how does that emptiness resonate with the tale that Bartlett is reworking? There is a straining tension at the heart of this updated adaptation, but it is a damaging rather than a productive antagonism. Alongside the contrast of ancient and modern, the production frequently finds itself torn between opposing camps: misogyny versus the plight of women, psychological damage versus seemingly unexplained madness, logic versus magic, religious faith versus the empty realisation that all we have is “life and death and the waiting in between”. In clumsily negotiating between the ancient and the contemporary, Bartlett’s version finally comes down on the former. Abandoning the lacklustre attempt at psychological exploration that lightly peppers the piece, in the end his Medea is faithfully vicious and unrepentant. As she stands at the play’s close dripping with blood and triumph, Euripides’ starkly uncompromising vision of a woman prepared to go to any lengths for revenge emerges unscathed from the wreckage of this muddled attempt at wrenching her into the modern day.